Getting ready to head north to Columbus for the 2016 World Fantasy Convention. Looking forward to buying used books, talking to experienced authors, editors, and illustrators. Should be fun. This will be the first time I join a panel... and I have the honor of moderating one too! We can think of numerous examples of fantasy writers (novelists or short story writers) who were also accomplished painters or illustrators – from Mervyn Peake to Janny Wurts. How does working in one medium affect work in the other? We hope to hear from active contemporary writer-artists on this panel, not just talk about them. The writers who will never be popular but who will never fade away. It has been suggested that at least one person a year will read David Lindsay’s A Voyage to Arcturus with great fascination from now until the end of time. But he will never be popular. Clark Ashton Smith’s prose style repels some and enchants others, but we know he will never sell millions of copies. We don’t mean just neglected writers. What about the “difficult” writers? Does James Joyce’s Finnegans Wake (a dream fantasy of sorts) fall into this category? What is the place for difficult prose styles or ideas which can only reach the few and never the many? The Gonji Deathwind trilogy was really one book cut into three parts. Take home message: if you decide to follow Gonji, just plan on reading the whole trilogy. This review combines my first two reviews with additional commentary. Gonji is a mysterious, intelligent character. familiar with many languages (Japanese, Spanish, Italian, German, English, more?) sufficiently to converse with anyone. He is a bit moody too, which is ostensibly related to his mixed heritage (disciplined father, wild mother). His allegiances are difficult to predict, sometimes joining mercenary bands, sometimes rescuing weak townspeople. Generally, the blend of cultures and Gonji’s mysterious motivations are engaging. I enjoyed Part-1 (Red Blade From the East) but was left wondering about character motivations; also my mind struggled to contain a geographic scope that seemed to only grow. 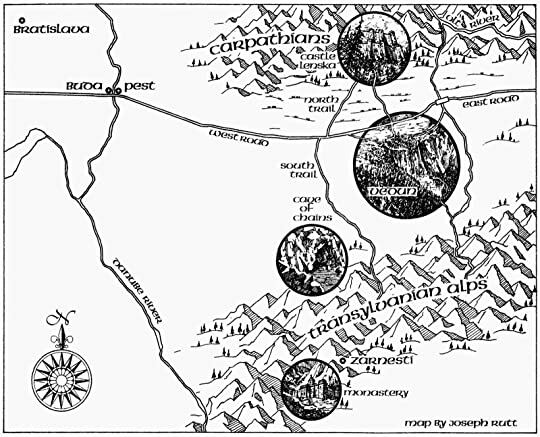 The second installment pleasantly explored all the characters and mysteries posited in the first; geographically, it focused on one location essentially (Vedun city and the adjacent Castle Lenska). It delivered on every aspect I hoped, and the conflict/story leapt forward every chapter; it unveiled truths behind several key secrets & motivations behind the characters, and ramped up the adventure (which was at a high level anyway). Great adventure fantasy that is more dark & pulpy than it is historical. I like the content in #1 more after reading #2, and I can’t see how any reader could not stop without tackling #3. "It looked like a gaping hole in the space above the ward, yet shaped like something reptilian. And its eyes—that horrible yellowish glare that suggested eyes—seemed to see everywhere at once, to burn into the soul of the watcher with ghastly promise of lost eternity. In its wake it carried...dancing things, whirling and lashing about in tormented rhythm. Lost souls, grasping for a new purchase in the world of men that always seemed close, yet ever out of their reach." 2016 and beyond UPDATE: DARK VENTURES, from Wildside Press due out late 2016, and according to the author, "It comprises two new novellas, my essay on the series' creation/production history, and a generous excerpt from the coming Gonji origin novel, BORN OF FLAME AND STEEL." And [Rypel] just agreed to a commission to write a NEW Gonji short story for an anthology scheduled for next summer (2017). Leigh Brackett's sword & planet adventure is a short novel but a favorite among aficionado's. Let's read: The Sword of Rhiannon...first published as Sea-Kings of Mars and Otherworldly Stories in "Thrilling Wonder" Magazine in 1949 (banner image from cover artist Earle Bergey). Conan Pastiche, from 100% pastiche to posthumously finished tales, lets read how non-Robert E. Howard authors continued the barbarian's adventures! Lin Carter and L. Sprague de Camp's 1967 Conan (banner image and cover art by Frazetta).